This tool is an AviSynth script with GUI which uses Avidemux as a backend. 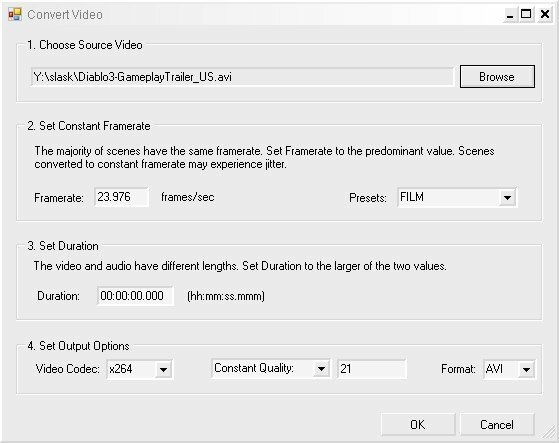 It simplifies and automates the process of converting variable framerate video to constant framerate video. Experiencing a progressive loss of audio sync in a video? Variable framerates may be the cause. Audio tracks are not processed. Mux them after conversion. Avidemux filters are not supported or processed. Added a 'Reset Filter' utility because of the ongoing random issues with all codecs where blocky and blurry areas appear in the rendered output. Deblocking commands were useless. A possible cause is the framecount attribute in DirectShowSource which seems to trigger the problem. The new utility runs a sample render job to reset the filter used by DirectShowSource. It is usually successful but must be used again if blocky output occurs.